The International Monetary Fund released its latest World Economic Outlook on Thursday, and as part of the report it imagined what would happen to the world economy if the conflict in Iraq were to escalate and Iraqi oil exports plunged by 50 percent. According to the IMF, world oil prices could increase by 20 percent in such a scenario. The IMF then modeled two scenarios: one with just an oil-price shock, and another with an additional shock to confidence. With a shock to confidence, the IMF assumes an additional reduction in the risk tolerance of investors, which leads to a sharp drop in stocks. 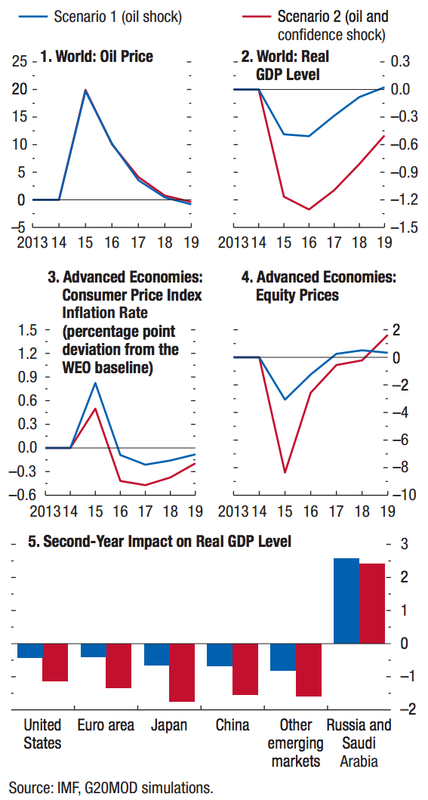 In the first scenario, the IMF estimates that global economic growth would fall by 0.5 percentage points, with a nearly 1 percentage-point rise in inflation for advanced economies and a slight dip in stock markets. But such shocks don’t affect every country equally. Japan and China would be hurt more than the U.S. or the Euro area, according to the IMF’s projections. And oil exporters Russia and Saudi Arabia would see an increase in growth. Read the IMF’s full report here.